The sky finally cleared and the wind finally calmed down enough to try out my new solar filter on my Celestron CPC800 Deluxe telescope. 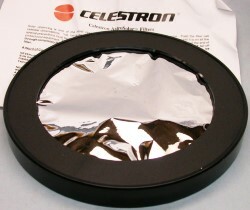 Since Celestron does not manufacture or sell the Baader film solar filters anymore I did a saved search on eBay and then waited for one that did not cost a ridiculous amount of money. They often sell for more than $100 - when you can even find one. I lucked out and got mine for $65 after about six months of waiting. 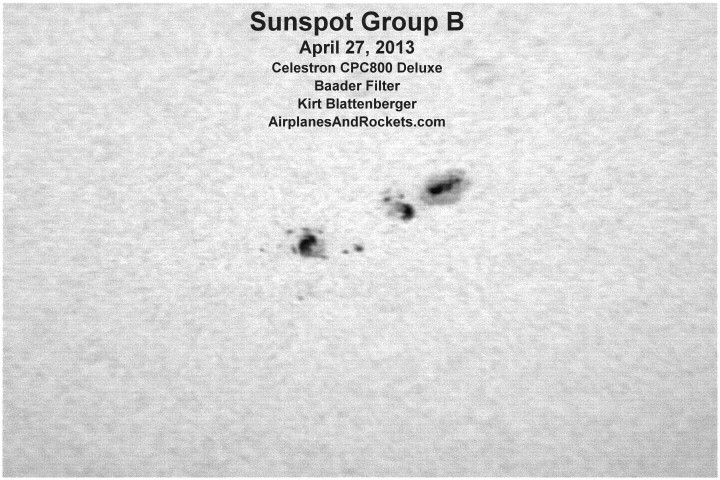 Unfortunately, by the time the sky cleared the sun was only about 30 degrees above the western horizon, so the seeing quality was not so great. 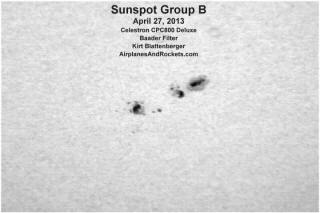 Still, the view through the eyepiece was awesome when the atmosphere steadied occasionally for a split second. 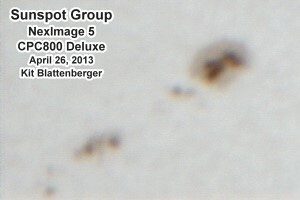 It was good enough to prompt me to go ahead and hook up the Celestron NexImage 5 camera. Achieving a good focus was impossible because of the scintillation, but as you can see from the image below, it wasn't a total loss. Poor contrast on the computer screen due to high ambient light level was a real problem, too, so next time I'll be sure to take a cloth drape to use like the old-time photographers used with outdoor shots. 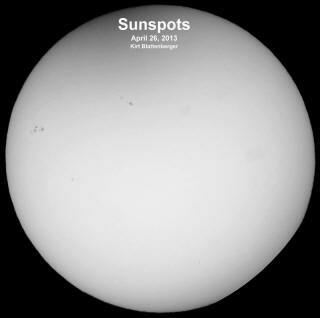 The large image of the entire solar disk was made by simply holding a point-and-shoot type camera up to the 32 mm eyepiece. The CPC800 Deluxe mount is incredibly stable and can withstand a lot of handling without shaking, especially at low magnification. 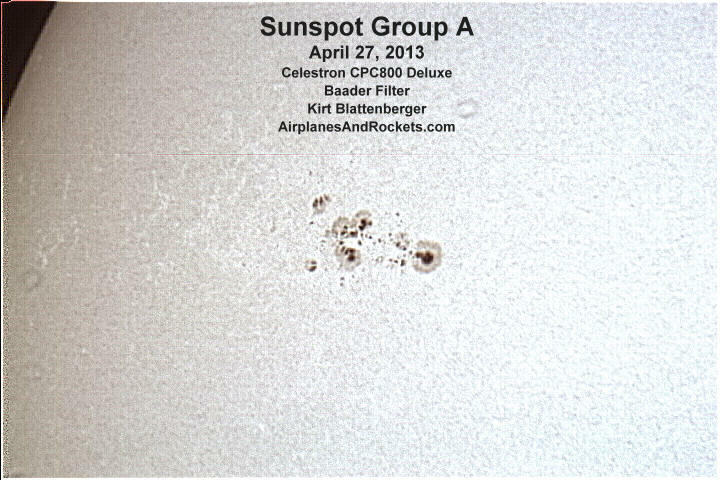 I did not attempt to do the same with higher magnification because the image was changing rapidly due to atmospheric disturbances. I figured the best chance of obtaining a good image was to use the video function of the NexImage 5 and run the results through RegiStax 6.1 software. The best example is shown below. April 27, 2013 Update: Today, we had a severe clear sky with only a breeze. I couldn't resist taking the telescope and camera out again. These results are even better than yesterday's. 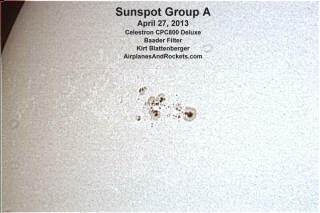 Sunspot group nicknamed "Spot" because it looks like a dog's face. 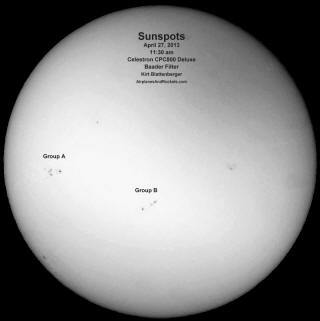 Sunspots on April 26, 2017. 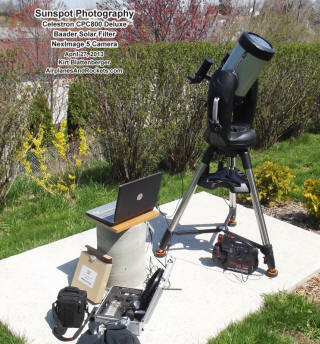 Celestron CPC800 Deluxe telescope using 32 mm eyepiece.